Calcutta (renamed Kolkata in 2001), the capital of West Bengal, was also the capital of British India from 1772 until the British decided to shift their capital to Delhi in 1911. The city faced a number of economic and political problems after the British left. However, over the last few decades, it has ripened into the cultural capital of India. 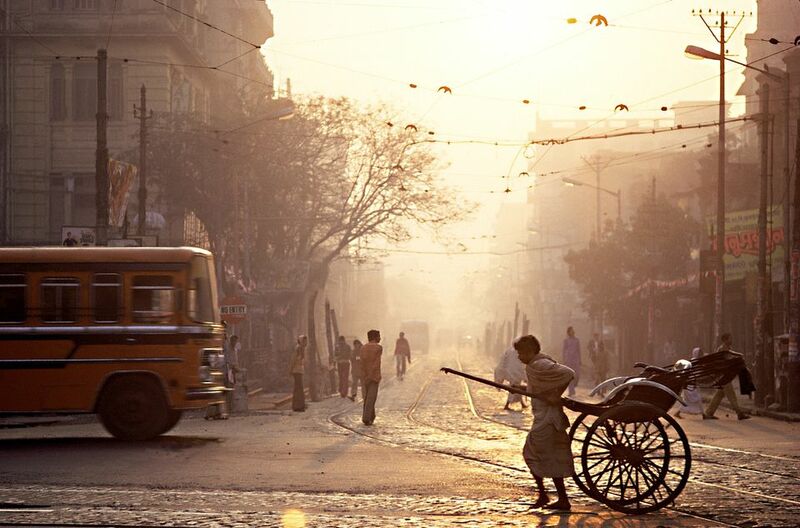 These pictures of Kolkata provide insight into this fascinating city, with captivating soul and crumbling buildings. The Kolkata Esplanade borders the Maidan is known as the heart of the city. It's a booming business district. The northern stretch, known as B.B.D. Bagh, used to be called Dalhousie Square. The Writers Building and Saint Andrew's Church are shown here. Victoria Memorial, located at the southern end of the sprawling Kolkata Maidan, is a memorial of Queen Victoria of the United Kingdom. She also had the title of Empress of India. The Memorial, an imposing white building that was completed in 1921, currently serves as a museum. It houses a collection from the British Colonial period, including a number of impressive paintings, sculptures, and books. The white Indo-Gothic designed Saint Paul's Cathedral, located at the southern end of the Kolkata Maidan, took 8 years to build and was completed in 1847. It was the first Episcopal Church of the Orient. The church has managed to survive two earthquakes -- one which almost completely destroyed it in 1897, and another in 1934 that led to the collapse of its tower. Inside, there is some magnificent artwork. These flower sellers gather daily at Malik Ghat, below the Howrah Bridge, from sunrise until sunset to sell their garlands. It provides a colorful and eye-catching display. The sellers can be found to the left of the bridge, just below where it starts on the Kolkata side. The market is a wholesale flower market, so it's only possible to buy in large quantities. Kolkata's wholesale fruit market is just as fascinating (and less-visited by tourists) as the flower market. Find Mechhua Fruit Market in Bara Bazaar, near Munsi Sadaruddin Street. It's close to M.G. Road, on the way to the flower market at Malik Ghat. Opened to traffic in 1943, the Howrah Bridge (officially called the Rabindra Setu, after renowned Bengali poet Rabindranath Tagore) crosses the Hooghly River to link Kolkata with its twin city of Howrah on the other side. Approximately 150,000 vehicles and 4,000,000 pedestrians use the bridge each day. The most impressive thing about this bridge is that it crosses the river in a single span, without any pylons connecting it to the river bed. It's one of the longest bridges of its type in the world. To get a feel for why the Howrah bridge is also said to be the busiest bridge in the world, you really must walk across it. It's only then that you'll truly get to experience the sheer volume of traffic that it carries -- including cars, buses, bicycles, bullock carts, and innumerable people bearing loads of heavy wares on their head. The traffic makes fascinating viewing! The sun sets over the Hooghly River, with the Vidyasagar Setu bridge in the background. This bridge is a Golden Gate Bridge look-alike. It was completed in 1994 to try and divert some of the traffic away from the busy Howrah Bridge. The bathing ghats of Kolkata, located along the Hooghly River, receive hoards of devotees who come to wash and make offerings each morning and evening. The Hooghly River is considered to be a branch of the holy Ganges River, and therefore auspicious. Two of the most popular bathing ghats are the Babu Ghat and Armenian Ghat. This is a picture of the historic Zenana Bathing Ghat, hidden behind Armenian ghat next to the Malik Ghat flower market near Howrah bridge. Built in the late 1880s or early 1890s, it was once one of the most beautiful bathing ghats in the city. Now it's dilapidated and rarely used, as there's no clear approach from Strand Road. A statue of Goddess Kali, the dark mother and patron goddess of Kolkata, on the side of a street in the city. Kolkata is the only city in India to have a tram network, which adds to its old-world charm. These historic tramcars have traveled the Kolkata streets since 1873, and operate on over 30 routes. Hand-pulled carts are still commonly used for hauling cargo short-distances around Kolkata. These three men use all their strength to pull the cart, while another man pushes it from behind. Despite their exertion, their smiles are warm and capture the friendly spirit of the city. A bhisti (water carrier) with his masak (goat skin bag) full of water. These water carriers were indispensable in supplying water to the British but demands for their services has dwindled since the introduction of plumbing. However, Bow Barracks in Bow Bazar is one place where they still operate. Small shops line the side streets of Kolkata's busy market areas. Political parties wage war on each other by plastering slogans around. This image was taken in Bow Bazaar. Kumartulli is the district in north Kolkata where most of the idols are handcrafted for the annual Durga Puja festival. It's possible to visit Kumartulli to see the Durga idols being made. In the lead-up to the festival, thousands of artisans (many who are hired from other areas) toil diligently in approximately 550 workshops. It's really interesting to see. The Kolkata Maidan (which literally means "open field") is a huge expanse of land measuring 5 square kilometers (3.1 square miles) in the middle of Kolkata. It's owned by the Indian Army, and Fort William is located there. The Maidan is open to the public, who use it to play sports, relax, and exercise. You'll never go hungry on the streets of Kolkata! Roadside vendors are always around to cook up an array of tasty Indian snacks. This small spice shop in Kolkata's New Market sells almost every spice imaginable! Plenty of small shops like these line the Kolkata streets. New Market is one of the top places to go shopping in Kolkata. Bengalis are passionate about sweets. You'll find shops loaded with all different kinds of them, most milk-based. Some of the most popular ones are rasgulla (soft cottage cheese balls in sweet syrup), sandesh (sweet moist cottage cheese fudge), and mishti doi (sweet yogurt/curd). This paan seller at Howrah Station has a line of tins containing various paan masala ingredients. Paan is usually served on a betel leaf and chewed.